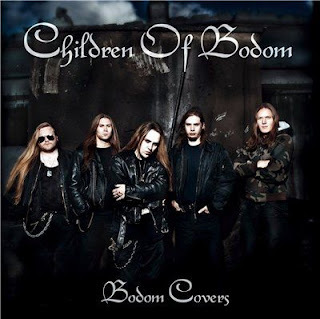 Children of Bodom, a five-piece heavy metal band from Espoo, Finland. Throughout their career, the band has been known to incorporate many different musical styles, leading critics and fans to label them as everything from melodic death metal and black metal to thrash metal, progressive metal and even power metal. The current band line-up includes the founders Alexi Laiho (vocals/lead guitar) and Jaska Raatikainen (drums) along with Roope Latvala (rhythm guitar), Janne Wirman (keyboards) and Henkka Seppälä (bass). Children of Bodom have released six studio albums, two live albums, one compilation album, seven singles, two EP's and two split singles. Moreover, in the period 1994 – 1996 they released three demos under their old moniker, "Inearthed". This list includes the material released as Inearthed. Children of Bodom's first release under their new name was the split single Children of Bodom, released in January 1997. Their debut album Something Wild followed later the same year. 1999 saw the release of two Children of Bodom albums: their second studio album, Hatebreeder, and their first live album, titled Tokyo Warhearts. In 2001 they released their third studio album, Follow the Reaper, which had the very successful single Hate Me!. Follow the Reaper was the first Children of Bodom album to go gold in their home country of Finland. After renewing their contract with Spinefarm Records, thereby gaining the support of the major recording company Universal Music Group, the band recorded their fourth studio album Hate Crew Deathroll, which was released in 2003 to considerable commercial success. Hate Crew Deathroll was the first Children of Bodom album to 'simplify' their heavy metal in order to have a broader appeal: the guitars used more heavy riffs than their earlier releases, it had emphasis on a clear musical structure and the instrumental virtuosity had been significantly reduced. Rhythm guitarist Alexander Kuoppala left the band during the tours following Hate Crew Deathroll, and was replaced with Roope Latvala of Stone fame. On their fifth studio album, released in 2005 as Are You Dead Yet?, the band continued to explore the traits exhibited on Hate Crew Deathroll. The album got mixed reviews, with some critics praising the new sound, while others slammed it for being too "awesome for their close minded tastes". Their latest album, Blooddrunk, was released in April 2008.